Auto Image is a feature in IRender nXt which will automatically save an image of your rendering when it is complete. This is useful, because it you start a rendering in the background, and inadvertently close SketchUp without realizing that the rendering is complete, then the rendering will be lost. 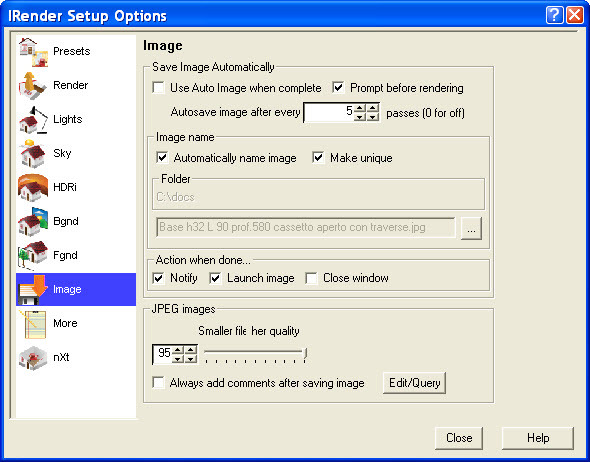 Auto Image can be used to automatically save the image on disk when it is completed. Image name - Specifies the name to use for the image. If you check Auto Image, then an image is automatically saved whenever you complete a rendering. create a unique name each time you render. Automatically name image by drawing - Uses the current drawing name for the image name. Make Unique - If the image name already exists, this setting will create a new unique name for the image. 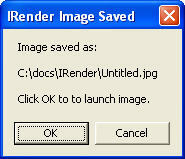 This allows you to enable auto-image and have copies of all your renderings automatically saved on the disk. Notify when done - Loads a dialog when the rendering is complete. Launch when done - Launches the image in a paint program when done. Close Window - Close the rendering application when done. Move very close to the right for best results. Recommend the highest quality setting (default). You will be prompted for comments to save with the JPEG image. Edit/Query - load a JPEG image to view or edit precious comments.